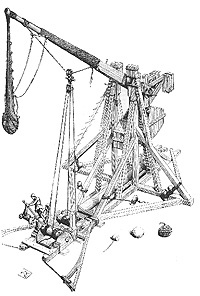 A collection of resources related to Trebuchet building, medieval weapons of mass destruction, siege engineering, and other related items of interest. The trebuchet is thought to have been invented in China between the 5th and 3rd centuries BC. 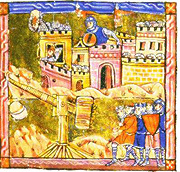 The counterweight trebuchet evolved from the simpler Chinese traction trebuchet. The device reached Europe around 500 AD. It could fling three hundred pound projectiles at incredible speeds into an enemy fortification, quickly obliterating walls and defenses. Plans, simulators, photos. Rom Toms, inventor of the Floating Arm trebuchet. Built in 1995, by the committee of the campaign "Rädda Visby Ringmur" ("Save the Ring-Wall of Visby"). The engine with its 5840 lb counterweighted arm now resides at Gotlands Fornsal (the County Museum of Gotland). Anders Helleteg photo of ring-wall of Visby. Report by Dr. Peter Vemming Hansen describing siege engine work at the Medieval Centre, Denmark. Hew Kennedy built trebuchet with 3 ton counterweight and interesting projectiles. Northern Exposure: "Burning Down the House"
Famous episode (3-14) where Chris searches for the "right" cow for his trebuchet as part of his new piece of performance art. In the end, he flings a piano instead. 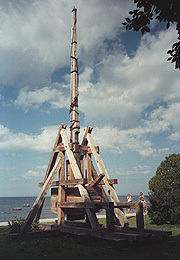 Chevedden, et al., "The Trebuchet", Scientific American, July 1995, pp 66-71.